What’s old is new again, and very healthy. So much green, sure does a body good! Kale is on the chic list in all the fine and fancy bistros. Kale, everyone’s talking about it and putting it in and on practically everything! Hey, why not? This leafy green packs a punch when it comes to being good food and good for you. 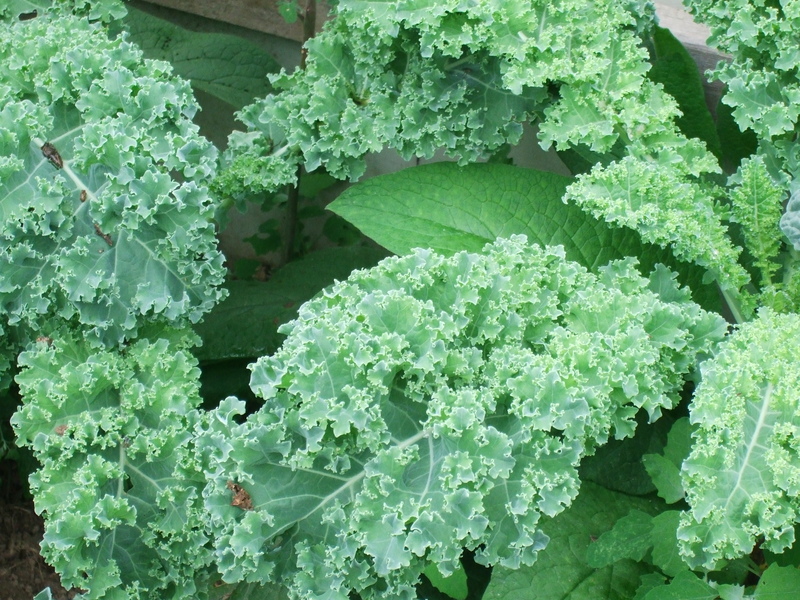 Long used in North America as an ornamental garden plant for borders and walkways, Kale has come a long way from the flower garden to the vegetable garden and now into our daily nutrient food source. Kale has long been a staple food in Europe for centuries as a peasant food. Until the end of the middle ages, kale was one of the most common veggies in Europe. During World War II, the British adopted it for their dinner tables because of its important nutrients and it was easy to grow. Scotland used it as a staple food due to the tough, cold and hearty growing conditions kale can withstand. Fresh young crispy Kale can be used raw in salads. Mature leaves and stalks are typically cooked or sautéed. Many kitchens are using it in soups, stews, salads, pizza, and pasta. It is also used in a variety of traditional recipes with potatoes, green beans, poultry, and meat. Fresh kale juice is quite popular among juice bars everywhere. Foodies are making amazing smoothies with Kale! Try a Kale, Pineapple and Almond Milk combo. In a large pot of boiling salted water, cook kale for about 3 min or until bright green. Using a slotted spoon or strainer, remove kale from water and transfer to a colander to drain well. Bring pot of water back to a boil. Add fettuccine and cook according to package directions until al dente. Drain and return to pot. Meanwhile, in a large skillet, melt butter over medium heat; sauté onion, red pepper, garlic, 1/2 tsp (2 mL) salt and 1/4 tsp (1 mL) pepper for about 5 min or until softened. Add kale; cook, stirring often, for about 3 min or until kale is tender. Add lemon zest. Whisk flour into cream; gradually stir into skillet. Bring to a simmer, stirring. Reduce heat and simmer, stirring, for 2 min or until slightly thickened. Pour sauce over pasta and toss to coat. Season to taste with lemon juice, pepper, nutmeg and up to 1/4 tsp (1 mL) more salt. Serve sprinkled with Parmesan. An amazing alternative to potato chips which are showing up on store counters everywhere. Make your own for a fraction of the cost. Wash and pat dry kale leaves. Tear into smaller pieces. Toss with 2 Tablespoons of olive oil and 1/4 teaspoon each of salt and pepper. Arrange in a single layer on a baking sheet. Bake 375 degree oven until crisp, 10 to 15 minutes. 2-3 chopped fresh tomatoes or handful of cherry tomatoes, pierced with a pick. Heat olive oil in a heavy-bottom pan or Dutch oven over medium-high heat. Add onion and cook 5 to 7 minutes until lightly browned; add red bell pepper, carrots, and garlic; sauté 5 minutes. Reduce heat to medium. Add potatoes, kale, beans, tomatoes, chicken stock, salt and pepper; simmer until potatoes are tender, about 10 to 15 minutes. Add additional water or stock if mixture becomes too thick. Before serving, stir in vinegar and garnish with rosemary. This spicy tomato smoothie provides all the healthiest and tastiest things about a bloody mary without the alcohol. Add all ingredients to blender and blend until smooth. Adjust spices to taste, pour, and top with a stock of celery. Cute umbrella optional. While the quinoa is cooking, take a large serving bowl and combine half of the lemon juice (reserving the other half), all of the lemon zest, scallions, walnut oil, pine nuts, and goat cheese. This entry was posted in Uncategorized and tagged Kale, Pasta, Veggie Vivers. Bookmark the permalink.